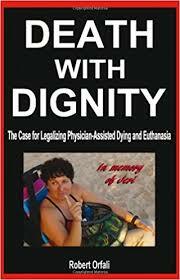 Research papers on death with dignity discuss the term used to refer to a legal avenue for terminally ill individuals to get medications from their doctor that will allow them to peacefully end other own life. Death with dignity is the term that is used to refer to a legal avenue for terminally ill individuals to get medications from their doctor that will allow them to peacefully end other own life. Other names for this process include physician-assisted death, physician-assisted dying, and aid in dying. Those that appose the process have called it “assisted suicide”, “doctor assisted suicide”, and “euthanasia”. This is a voluntary request that a patient can make when they are looking for a way to end their suffering. There are certain states the allow for the legal death assistance to take place. Just as it is a patient’s choice to pursue this avenue, physicians also have the option to provide death with dignity services. Doctor’s with different specialties might offer this service including general practitioners, hospice doctors, hospice doctors, oncologists, neurologists, pulmonologists, and psychiatrists. There are even dermatologists who participate in this service. Legally any doctor living in a Death with Dignity state is able to prescribe the life ending drugs. The process does require two certified doctors to work together to make sure all the requirements set out in the Death with Dignity law is met. Most, around 95%, who chose to go through the process chose to be in their home when they take the life ending drugs. The most common drugs prescribed for the process are pentobarbital or secobarbital. Both of these drugs can vary in price anywhere from $400 to $5,000. The process is governed by state legislation. Currently five states allow physicians to assist patients in their own death. These states include Oregon, Washington, Vermont, California, and Colorado as well as The District of Columbia. It is also legal in Montana as ruled by the state Supreme Court in 2009 but it is not a formal law or statute. Death with Dignity Laws - Research papers on death with dignity laws discuss the laws that allows for physicians to provide their terminally ill patients with lethal doses of barbiturate medications in order to help them end their lives. Euthanasia and Medical Ethics research papers examine how the AMA views physician assisted suicide. Ethics of the Right to Die Research Papers - What is the difference between what we ask (the right to die) and what is perceived (assisted suicide)? Against Euthanasia Research Papers - Euthanasia is the term used to describe assisted suicide. Euthanasia and Morals Research Papers - The state of Oregon in the United States has laws that allow for assisted-suicide, but not for euthanasia. Ethical and Legal Implications of Euthanasia - WHETHER to permit assisted suicide and euthanasia is among the most contentious legal and public policy questions in America today. End Life Care - End of life Care research papers examine the type of care in the medical profession directly involved in the treatment of individuals with fatal illnesses. Paper Masters writes custom research papers on death with dignity and discuss the term used to refer to a legal avenue for terminally ill individuals to get medications from their doctor that will allow them to peacefully end other own life.